89-year-old Eenoapit Sageatook remembers starting her days with a breakfast of Canada goose or duck eggs and later filling up on cooked or raw meat. “A hunter would capture and harvest a seal, bring it in, and then we’d catch up on conversation while eating,” she recalled of her nomadic upbringing between Kimmirut and Iqaluit, in ‎Canada’s northern territory of Nunavut. The rapid shift from that hunter-gatherer lifestyle to today’s more sedentary habits has dramatically eroded the nutritional content of the Inuit diet. The Nunavut Food Guide still places ancestral “country foods” such as arctic char, caribou and ringed seal at the heart of a balanced diet, but the prohibitive cost of modern hunting equipment and store-bought country foods make it hard for most Inuit to maintain traditional diets. Now, they eat mainly imported items, supplemented with nutrient-rich harvests when possible. “It’s a culture that’s very dependent on elders. Your elders taught you everything; it’s all handed down … how to hunt, how to sew and how to follow the caribou routes. Suddenly that life has been taken away,” said Michael Lockley, chef of the Qajuqturvik Food Centre in Iqaluit. Without elders’ guidance on budgeting, food preparation, and nutrition in this new context, the adjustment has been understandably slow. In the context of limited availability of affordable produce and limited cooking skills, it’s easy to revert to buying high-calorie, processed foods. For a similar price, a ready-serve lasagna is more filling than salad. In Iqaluit last summer, a carton of subsidized Tropicana orange juice—which costs CAN$5.97 at a southern Canada Walmart—cost CAN$12.49 after a Nutrition North Canada subsidy of CAN$0.92. A small bag of baby carrots cost CAN$4.09 post-subsidy, compared to CAN$3.47 at Walmart. In Pangnirtung, a small picturesque hamlet north of Iqaluit, the same carrots were fortunately 50% off in July—but over 3 weeks past their expiration date. All produce is flown in, and sometimes arrives expired or wilted. Shortages and delayed shipments are routine. The nature of hunger itself has changed, too. The term “food insecurity” helps distinguish modern hunger from the periods of starvation Sageatook witnessed during the hunting seasons in her youth. Nunavut’s current overweight and obesity problem seems to point away from a food insecurity crisis, but as families reach for affordable, processed foods over expensive country foods and unfamiliar produce, malnutrition and obesity form a familiar dyad. “I don’t even buy carnation milk, it’s not my thing. I see it a lot. Growing up, I see kids having carnation milk for formula,” says a mother of six from Iqaluit, Nunavut. DeMaio, originally from Burlington, Ontario, has practiced in the Arctic for 25 years—9 as the sole doctor in the Pond Inlet area, one of the northernmost settlements. She cited rickets, iron deficiency anemia, severe tooth decay, and ear infections as the most visible effects of malnutrition. “The kids I used to see in Pond Inlet—and they’re still there—I could tell as they walked up to the health center that they had vitamin D deficiency so profound that their legs were bowing,” DeMaio recalled. Rickets, completely avoidable with vitamin D supplementation and thus rare in North America, was suspected in 24 children in Nunavut in 2012. It’s one of the many diseases that disproportionately affect the Inuit. The rate of tuberculosis, which the Canadian government recently committed to eradicating in northern Canada by 2030, is 277 times higher in the Inuit than in non-indigenous Canadians. Furthermore, an oral health survey found that Inuit children aged 3-5 had on average 8 decayed, missing or filled baby teeth. DeMaio has also noticed a dramatic increase in the incidence of diabetes—which she attributes to the changes in diet and activity levels of Nunavut residents—along with increasing cases of high blood pressure and heart disease. “Fewer people are going hunting and getting physical activity, and people are also eating high-carb, heat-and-serve meals—and drinking pop,” she said. Rampant soda consumption inspired Nunavut’s “Drop the Pop” campaign. Until 2009, Iqaluit even had its own Coke bottling plant, with bottles marked as “Made in Iqaluit” in Inuktitut. Sheila Veevee prepares arctic char that was donated by a local hunter to the Pangnirtung Soup Kitchen. In these communities, DeMaio said, you’ll see some elderly people who are healthy, and more and more people between 40 and 60 being diagnosed with cancer. “Seems like the older ones grew up on that really healthy diet, and then we have this middle population… People in their 40s dying of bowel cancer is just so tragic.” Poor diet is one of many known cancer risk factors in Nunavut, where lung, oral and colorectal cancers are particularly prevalent compared to the rest of Canada. In Pangnirtung, food insecurity is one of many social factors connected to a mental health crisis as well. Last February alone, 12 Inuit youth in the town attempted suicide. 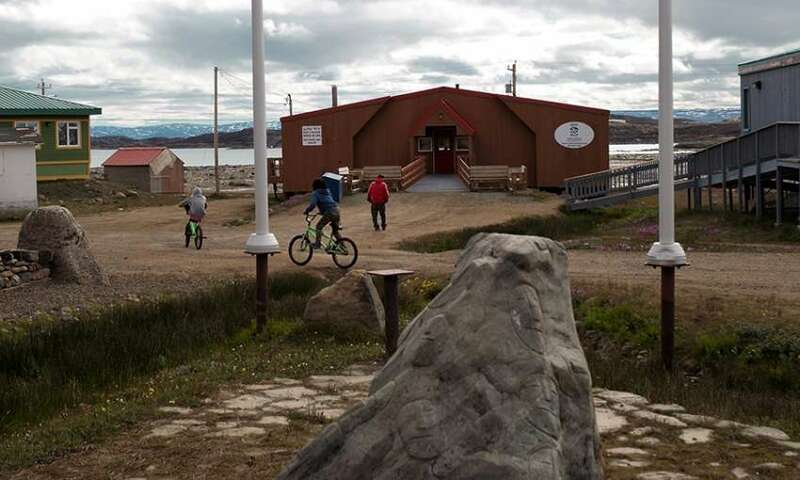 Pangnirtung’s youth centre, padlocked for months due to low funds, reopened recently, and is attached to a soup kitchen that serves dozens—including many children—3 days a week. Without a dishwasher or industrial oven, the kitchen is already operating beyond capacity, but the need is so great that staff wish it could be open daily. *Interpreter Lisa Ipeelie translated the discussions with the elders from Inuktitut to English. Julie De Meulemeester is a second-year medical student at McGill University. As a 2018 Pulitzer Center on Crisis Reporting Student Fellow, she traveled to Nunavut to report on food insecurity. She is also the Medical Students’ Society’s Vice-President of Global Health and is interested in public health and infectious diseases.